Puppy Kibble - It's What's For Dinner! Feeding a premium puppy kibble is one of the simplest and most reliable ways to make sure your puppy gets all the nutrients he needs to grow up big and strong, and healthy too! The proper balance of nutrients will help to prevent a host of health problems from developing later on. These can include obesity, bone/joint problems, kidney problems, allergies and more, PLUS a good diet can even increase the length of his life. Eating a well-balanced diet will keep your pup healthy and active, with a shiny coat, bright eyes, lots of energy and regular, firm stools. Yes, premium pet foods cost more than generic brands, but they're packed full of superior quality ingredients. Plus, they do NOT contain the fillers, additives, preservatives and 'junk' of many cheaper brands. But, it's easy to get overwhelmed, and a bit confused, by the huge variety of different puppy kibble brands and formulas. On this page you'll find some simple guidelines that will help you figure out what is a good puppy food (and what isn't) and whether or not it's right for your pup's age, breed or size. 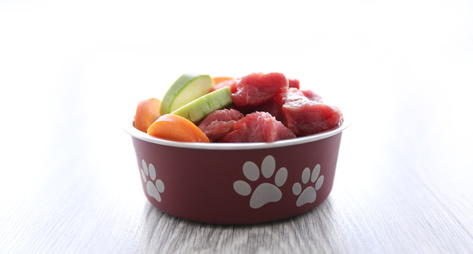 Little Fido needs much higher levels of protein, vitamins and minerals than is found in regular adult dog food. Small/tiny breed puppies need a different balance of nutrients than large, or X-large, breed pups. Getting too little, or too much, of certain vitamins and minerals, or too much or too little protein, can cause all sorts of health problems - particularly bone and joint issues. 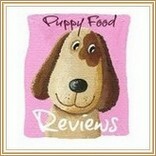 The quality of the ingredients in the puppy kibble you choose are of HUGELY important. It definitely pays to know which are the ingredients you want to see in your puppy's food... and which you want to avoid. My Best Puppy Food Choices page has all the tips, advice you need to make sure that the puppy kibble you choose for your new pup is exactly right. It tells you how to decipher the labels on puppy (or dog) food, what ingredients you should look for, the ratio of nutrients recommended for puppies of different sizes and more. The ingredients label on the bag of kibble you choose is where you'll find the information you need. Although dry kibble is the most popular choice for puppies and dogs today, canned food may also be a good option for very young puppies, tiny and toy breeds, and old or sick dogs. Everything that I've just written here about dog food ingredients applies equally to the wet food as it does to the dry. How Much Puppy Kibble & How Often? 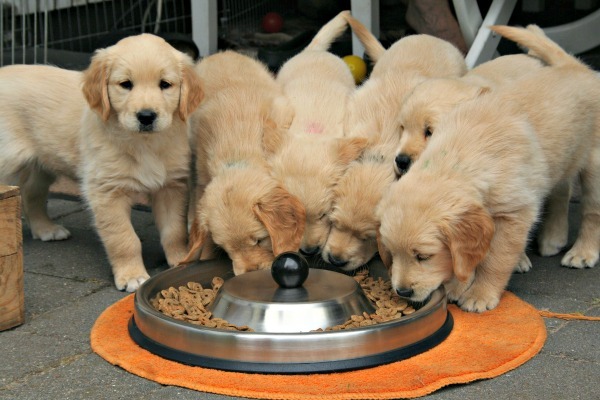 When it comes to how much puppy food to give your little one, there are a lot of factors to take into consideration, especially his weight, age, breed and activity level. There are always feeding guidelines on the food bag and I'd recommend using those as a starting point. They are usually calculated according to your pup's age/weight and give you a rough idea of what the 'average' pup of any particular age/weight needs. 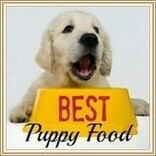 As a general rule, growing puppies need to eat almost twice as much food per pound of body weight than adult dogs do. But, of course, there's no such thing as an 'average' puppy, they're all unique and you'll soon learn where your pup falls on the scale between glutton and picky-eater! Puppies also go through a lot of developmental phases and stages as they grow, and these usually coincide with changes in appetite. Some days he might be starving all the time and act as though he hasn't even seen a meal in weeks.... other days he might sniff his food, eat a couple of mouthfuls and then walk away. Both of these are normal and unless your puppy is refusing food completely or is showing any other signs of being unwell a fluctuating appetite is usually nothing to worry about. To find out more about how to calculate how much food your puppy, or dog, really needs check out my How Much To Feed Your Dog page. You'll find lots more tips and advice plus a handy calculator that will help you figure out the number of calories he needs each day. 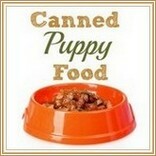 As for how often to feed your puppy, there are some simple guidelines that work for most puppies. Puppies who are between 7 and 16 weeks old should be fed 3 times a day - once first thing in the morning, once around noon, and then the last meal at around 6pm. Making 'supper time' in the early evening rather than later, means that there's time for the food to make it's way through your puppy's digestive system and be deposited in your yard before bedtime! Leave your pup's bowl down for approx. 10 - 15 minutes at each mealtime, then pick it up. Do not 'free-feed' as that can lead to bad habits such (such as 'grazing'). 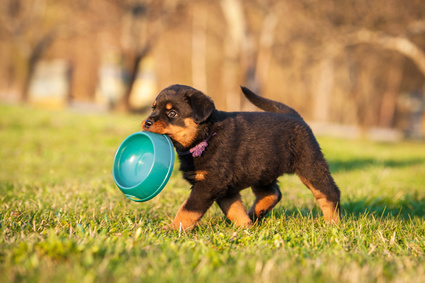 If your puppy can eat whenever she wants, her digestive system won't ever get into a routine and that means her elimination habits will be erratic as well. It's much quicker and easier to potty train a puppy who is on a regular, predictable schedule of mealtimes because what goes in must come out... fairly shortly afterwards! 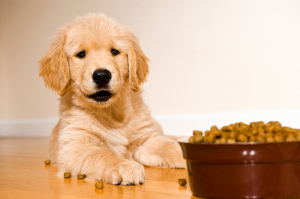 As for how much puppy kibble to feed... it's best to look at the individual manufacturers guidelines to start with. Notice whether it's calculated using a daily total or on a 'per meal' basis and then do the math to make it suit the schedule you've chosen. One thing it's easy to forget is that the treats you feed your puppy every day can add up pretty quickly! Puppies need lots of training sessions, and tasty goodies play their part in showing your little one what behavior you approve of. To avoid filling her little tummy up with 'rubbish', always choose healthy dog treats, and keep them small. If you have a tiny puppy, or have chosen large treats, break or cut them up into small pieces before you use them. Your puppy needs access to plenty of fresh water all day, but it's a good idea to pick it up at around 7pm so that she won't need to make quite as many potty trips overnight. From 4 months onward you can give your pup 2 meals a day, once in the morning and once in the evening, is just fine. You want to continue to feed your pup a food that has been designed for puppies until he is an adult, or at the very minimum until he's an adolescent. Large breed puppies mature much more slowly than the smaller breeds, and it can take anywhere between 18 months and 3 years before a large or giant breed pup can be considered adult. However, most small breeds are fully mature by about a year old. For a little dog, begin a gradual change over at about one year old. For a large breed puppy you need to wait until he's approx. 18 months to 2 years. For a medium breed puppy whose adult size is between 20 and 50lbs ( 9 - 22.5 kg) go somewhere in the middle range.... start the change over to adult food at around 12 - 16 months. 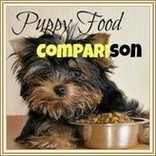 There really isn't a one-size-fits-all puppy food because there are so many different sizes and breeds of puppy. Some of the premium brands do come in an 'all-life-stages' formula which will suit an medium sized, healthy pup through adolescence and into adulthood. Once your pup is fully grown, pick out one of the best adult dog food brands you can find and stay with it for as long as it suits your pet. TIP: If you stay with the same brand/manufacturer/recipe etc. the switch shouldn't cause any of the tummy upsets that can accompany a sudden change in diet.